Most of the nuts and bolts of betting on Super Bowl XXVI in 1992 are relatively simple. However, there’s a lot more to it — $10 million more. Early in the second quarter, the Washington Redskins steamrolled out to a 17–0 lead from which the Buffalo Bills would never recover. Washington’s defense sacked the Bills’ Jim Kelly four times and intercepted him four times. Redskins quarterback Mark Rypien completed 18 of 33 passes for 292 yards, two touchdowns and an interception, on the way to earning the Super Bowl MVP award. 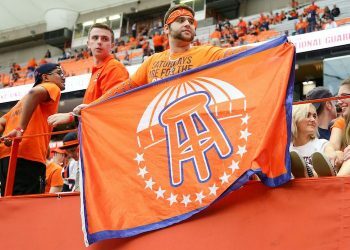 As fans in more and more states are learning, as they now wager legally in many more markets beyond Nevada and illegally everywhere else, sports betting provides a captivating narrative far beyond the final score. For Las Vegas casino owner Michael Gaughan and all of the sports betting universe, his gamble that the Redskins would not win the game by exactly seven points – in effect the largest Super Bowl bet ever made – provided a game within a game that’s still talked about 27 years later. In an effort to jump start the Super Bowl wagering that was going slowly, Gaughan instructed his sportsbook manager, now-retired Bert Osborne, to put up a line in which bettors could take the Redskins at -6 ½ or the Bills at +7 ½ at -110 either way. It was an open invitation for any bettor to bet both sides. In betting parlance, it’s called a “middle.” That meant if the Redskins won by exactly seven points, it was possible to cash both wagers. If the game didn’t land on seven, and you bet both sides, all you lost was the 10 percent vigorish – called “juice” – on the losing wager. Reizner was regarded as an overly cautious bookie in his later years. In his earlier days, it was his brainstorm that created the first high- stakes football contest when he ran the book at the Castaways, located where the Mirage now sits on the Las Vegas Strip. For Reizner, circling the Super Bowl caused a local reporter to dub him “The Lord of the Rings,” a phrase of derision he would, most unfortunately, carry from that point forward. Gaughan said the idea to offer the middle was conceived in what was called the Barbary Coast “Power Booth,” where Gaughan’s executives dined in the back of Barbary Coast coffee shop. However, his idea worked out better than even Gaughan initially thought. But did it work out too well? One of those bettors seeking to “middle” Gaughan was high-stakes poker player and colorful fellow casino owner Bob Stupak. Gaughan told Sports Handle and Osborne confirmed that Stupak showed up at Gaughan’s office with the cash neatly wrapped in plastic bundles and the bet was made. Stupak was risking $50,000 (the vig if the game didn’t land on 7) to make a possible $1 million. Now Gaughan was confronted with the possibility that the game could land on seven. Should the Redskins win by exactly seven points, he would be in the hole for about $10 million in losses. Gaughan had to be able to pay off. That meant having $10 million in cash easily accessible. Not exactly a slight task. 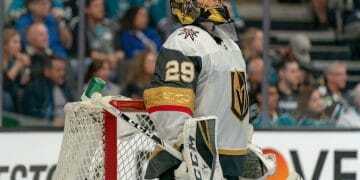 Gaughan told Sports Handle he made sure that his father, Las Vegas casino owner and gambling legend Jackie Gaughan, and his friend and mentor Benny Binion, would be able to front him some extra cash in case he needed it. 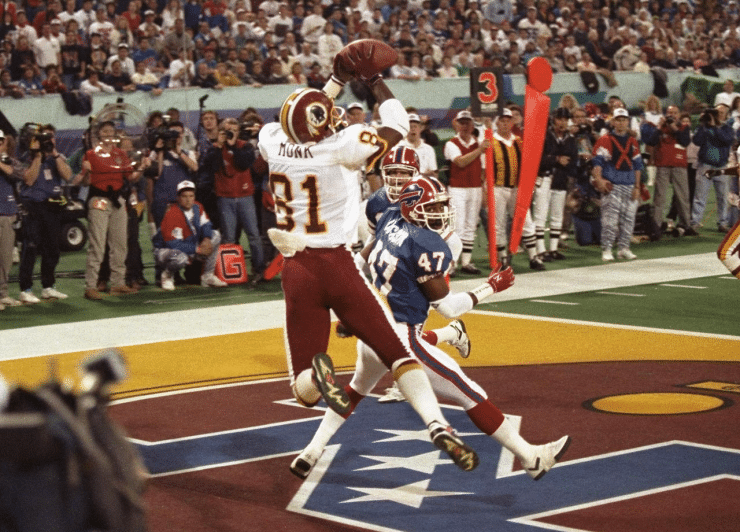 The telecast of the Super Bowl XXVI on CBS was seen by an estimated 79.6 million viewers. One of those viewers was Michael Gaughan, the man who had $10 million riding on the outcome. Gaughan watched the game at home, under the covers in bed, accompanied by his Irish Sheepdog, “Big,” he said. “I promised God that if I won, I’d never do it again, and I never have and never will,” he said. Osborne recalls his moment of concern: “The Redskins were relatively easy winners, but the Bills did score to make the game 24-10 in the third quarter. One more touchdown and extra point for Buffalo might have put the game on seven.” The Redskins ultimately won, 37-24. However, the key question remains – What are the chances of an NFL game or the Super Bowl, to be exact, with the favorite winning by exactly seven? In 1992, nationally recognized oddsmaker Michael “Roxy” Roxborough told Washington Post columnist Andy Beyer that he believed the odds were 1 in 14. Stupak, who ended up losing $50,000 to Gaughan, said he thought the odds were about 1 in 18. Gaughan told Sports Handle he recalls the odds being in the vicinity of 1 in 25. Roxborough’s, Stupak’s and Gaughan’s estimates came at a time before the extra-point line of scrimmage was moved back and before a wide variety of rules were changed that increased NFL offensive production. Sports Handle asked Craig Mucklow, the degreed mathematician who runs the trading room for “in-play” betting at Don Best Sports, his opinion. Mucklow said, in today’s two-point era, he believes there’s a 7.4 percent chance of a seven-point favorite winning by exactly seven. Per Sports Insights, in 2013, before the kicking point-after-touchdown line of scrimmage was moved back, the chances of an NFL team winning by exactly seven was 11.5 percent, but those odds include either team, not just the favorite. It’s a question without a clear-cut answer, the kind of thing that’s at the root of any gamble. For the record, the NFL did not adopt the two-point conversion until 1994. In 2015, the NFL began allowing the defense on point(s)-after-touchdown attempts to return fumbles and interceptions for two points credited to the defensive team. Also in 2015, the point after touchdown kicking line of scrimmage was moved back 15 yards for a one-point kick conversion of 33 yards. All of these factors could impact a favorite winning by exactly seven points. Today, Super Bowl proposition betting has exploded with most bookmakers offering hundreds of them, including the game favorite (or underdog) winning by exactly seven points. Most of these proposition wagers have lower limits than traditional straight bets. In any case, come Feb. 3 when the New England Patriots take on the Los Angeles Rams in Super Bowl LIII, nobody will have $10 million riding that possible outcome, as Michael Gaughan did in 1992.